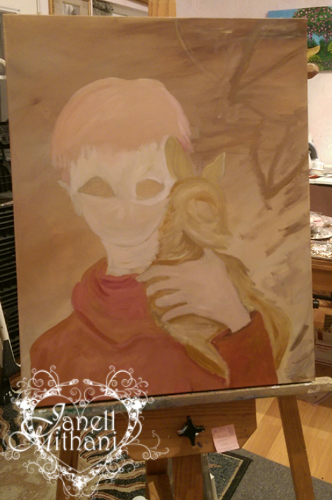 I am still working on my painting, “DOE.” but I thought I would share a few pictures of my progress. Here is the final sketch from my sketchbook. It is 8″ x 10″. Here is my sketch enlarged on a copy machine and pieced together. I wanted to paint this one pretty big, so I bought a 24″ x 30″ gallery wrapped canvas. And here is the painting with the main subjects blocked in. 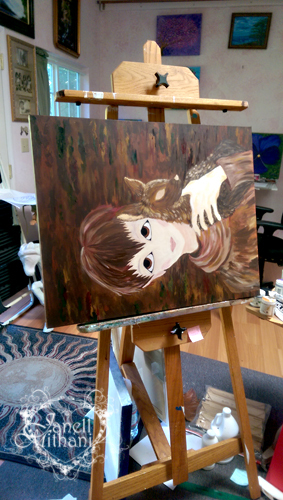 Now I started feeling the Fall weather and began getting some darker shades worked into the painting. 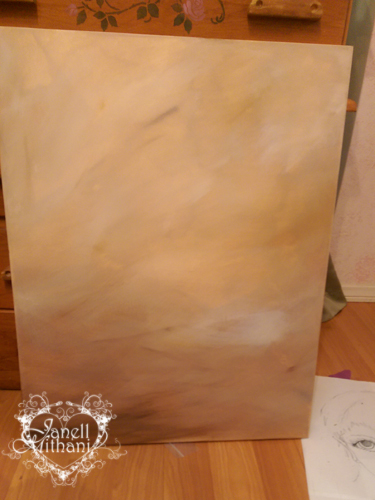 I always rotate my canvas around on my easel when I am painting certain parts. I especially like to paint the tips of my hair sideways. Anybody else do this when they paint or draw? Here is the whole painting sideways on my easel. I darkened up the background and added texture that gave me the feeling of bark on a tree. And here it is, right side up with the my progress, so far. 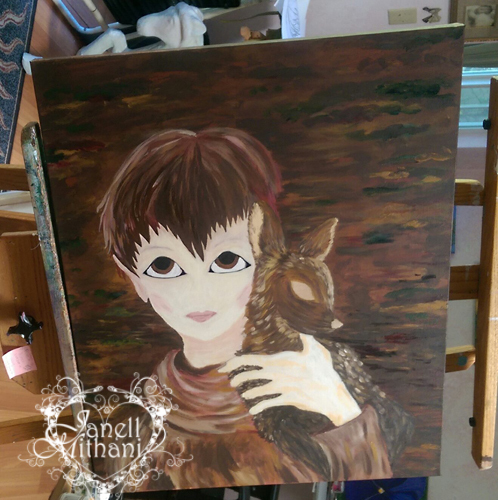 This entry was posted in Art and tagged doe, Fawn, painting, painting process. Bookmark the permalink. Watching a painting progress like that always thoroughly mystifies me! It boggles my mind how you see backwards from the finished painting you want, knowing what other colors to layer under it and how to build them up. It’s fascinating! Thanks for sharing. Very nice Janell I like it! Looking forward to see the finished painting! Wow! It’s beautiful, Janell. I love seeing the various stages. 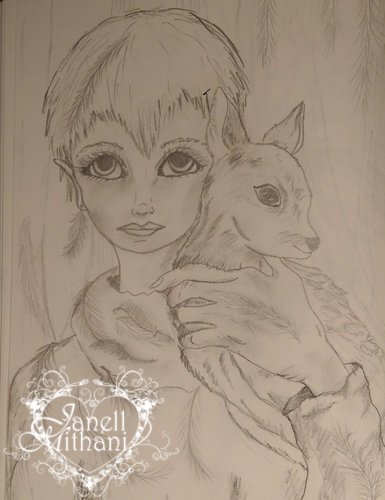 So beautiful Janell – wonderful being able to see your process. I’m in love with those awesome eyes! Love this work in progress style approach, first time I see it and is wonderful to see how you work! Love the turn on side technique, I do it too when I sketch, my working sheet finds all kind of awkward positions. Love the fall colors, the many brown, green, yellow shades but my favorite part is always your eyes, they are always magical just as fairies are! 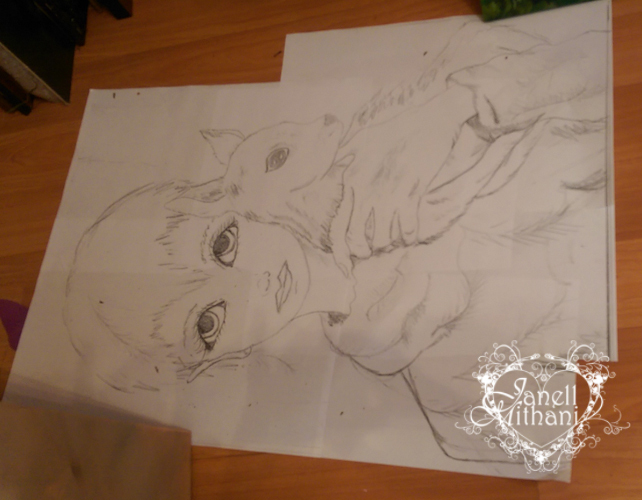 Wonderful post Janell, looking forward to see the finished painting! Thanks, Susan. 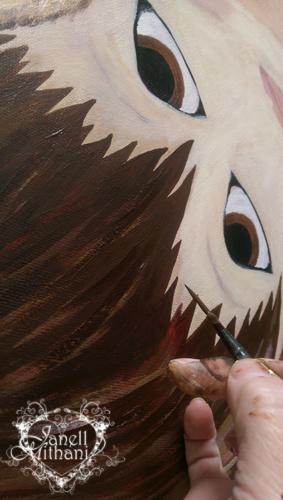 I do like to paint lots of layers so subtle wisps of color show thru. Thanks, Jill. Kind of like the different stages of a book? Eva, thanks so much. I wondered what people would think of my process. Funny that it hasn’t changed much over the years. Have a great weekend, too! Those “doe eyes” draw me right in! That’s so sweet. Thanks, Susan. Have a great week! Amy, reading such beautiful words from you is the greatest way to start my day. Thank you so much!